A 1915 warehouse, once one of Ford Motor Company’s Model T assembly plants, now houses the Human Resources Division of the Cincinnati Children’s Hospital Medical Center. SSRG teamed up with THP Limited Inc for the Lincoln Garage structural restoration package, which included concrete repairs and waterproofing. The 120,000 square foot structure was renovated to include not just office space, but also multilevel, in-building parking. Major sections of the building had been renovated into office space in 2002, but the parking garage portions remained largely untouched. As a result, by 2015, severe deterioration had set in. Concrete was failing, leaving plywood to protect visitors from falling debris. 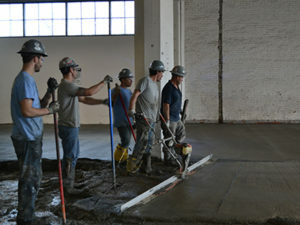 SSRG’s work was comprised of structural full-depth, partial-depth, slab on grade, and overhead concrete repairs. 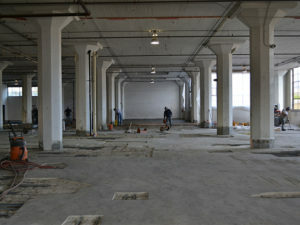 The installation of a traffic-grade waterproofing membrane was also required. In the end, our world-class team completed this work quickly and cost effectively.